The meeting on Sunday between King Abdullah and President Abdel Fattah El-Sisi in Amman came at a crucial moment for both leaders. El-Sisi was on a one-day working visit to Jordan that covered much more than boosting bilateral ties. Relations between Amman and Cairo are historically close and the two countries share interests in a number of regional issues. Aside from agreeing to boost cooperation in the fields of economy, trade, investment, the pharmaceutical industry, energy, transportation and labor, in addition to military collaboration, the two leaders discussed a number of regional issues, according to an official statement. These included supporting Palestinian rights and the need to resolve the conflict based on the Arab Peace Initiative, and the urgency of reaching a political solution to end the Syrian crisis. But discussions must have covered other pressing issues as well. El-Sisi’s visit came in the wake of a regional tour by US Secretary of State Mike Pompeo, which included Jordan, Egypt and the Gulf states. While in Cairo, Pompeo delivered a key speech that set out US policy priorities in the region in a bid to reassure America’s allies. He basically said that the US was not withdrawing from the region and that it would stand up to Tehran and its “deadly ambitions.” He declared that the US would “use diplomacy and work with our partners to expel every last Iranian boot” from Syria. While the speech was lambasted by critics of the Trump administration back in the US for being cynical, full of contradictions and obsessed with attacking former President Barack Obama’s Middle East policies, it remains to be seen if Pompeo’s assurances to Arab allies will hold. The confusion created by Trump on withdrawing his troops from Syria quickly, before backtracking, has raised concerns in Israel and among Syria’s neighbors. But what must have been discussed between King Abdullah and President El-Sisi is Pompeo’s call for the creation of a Middle East Strategic Alliance, whose objective will be to counter various regional challenges. 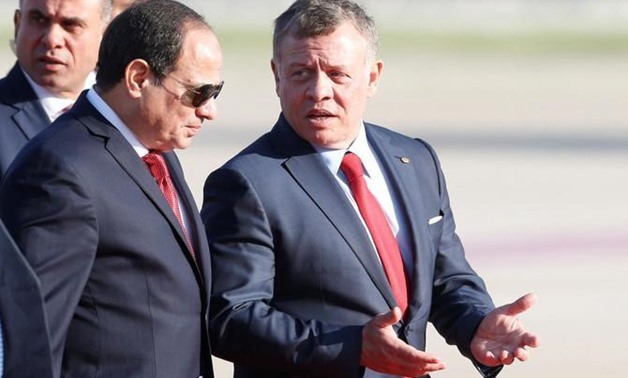 Certainly such an alliance, which could include Israel at some point, is a contentious issue for both Jordan and Egypt. It does not appear that the US has presented a thorough review of the proposed alliance to its allies in the region. More importantly, both Amman and Cairo have qualms about being members of an alliance whose first order of business could be to deal a military blow to Iran and its proxies such as Hezbollah. It is unlikely Amman and Cairo would accept being forced into a broad anti-Iran coalition whose ultimate objective remains ambiguous. Jordan, Egypt and the Gulf Cooperation Council states will be invited to the conference, in addition to Israel. While both Amman and Cairo are critical of Tehran’s meddling in Iraq, Syria and Yemen, it is unlikely that they would accept being forced into a broad anti-Iran coalition whose ultimate objective remains ambiguous. Both leaders have followed an independent foreign policy approach to regional conflicts and the idea of a US-led global conference on Iran would be seen as an encroachment on that independence. In addition to discussing the outcomes of Pompeo’s visit and declarations, the two leaders shared views on the latest developments in the Syrian crisis. There has been intensifying efforts by a number of Arab countries to restore Syria’s seat in the Arab League, especially before the convening of the Arab summit in Tunisia in March. While their official position on this issue has not yet been made public, there seems to be willingness in both capitals to take initial steps in that direction. Recently, the UAE and Bahrain reopened their embassies in Damascus, and there are signs that other countries will soon follow suit. Amman and Cairo have maintained a special relationship over many decades. Both countries play an important role in the fight against terrorism and in supporting the Palestinian struggle. Their common position on issues, especially as the region struggles to recover from the tumults of the past few years, will almost certainly have an impact on the reaction of other countries to Pompeo’s attempt to create a new military coalition.